Every now and then, a good friend of mine kindly host a group of quilters for an afternoon or evening of hand sewing (or embroidery or knitting/crochet). We try to get together every few weeks, as everyone's schedule allows. Five of us braved the rain yesterday to gather and chat about things quilting and not, while we sewed and munched on snacks (there are always delicious snacks!). It's always a pleasure to get together and make quilting more of a group activity. We're a varied bunch and there's always something interesting to talk about. Our hostess is working on a beautiful anniversary quilt for her parents, another friend smashed out a couple of crocheted preemie hats, there was appliqueing aplenty, and I stitched away on the sashing for the black/white/red/yellow quilt for my niece and her husband. 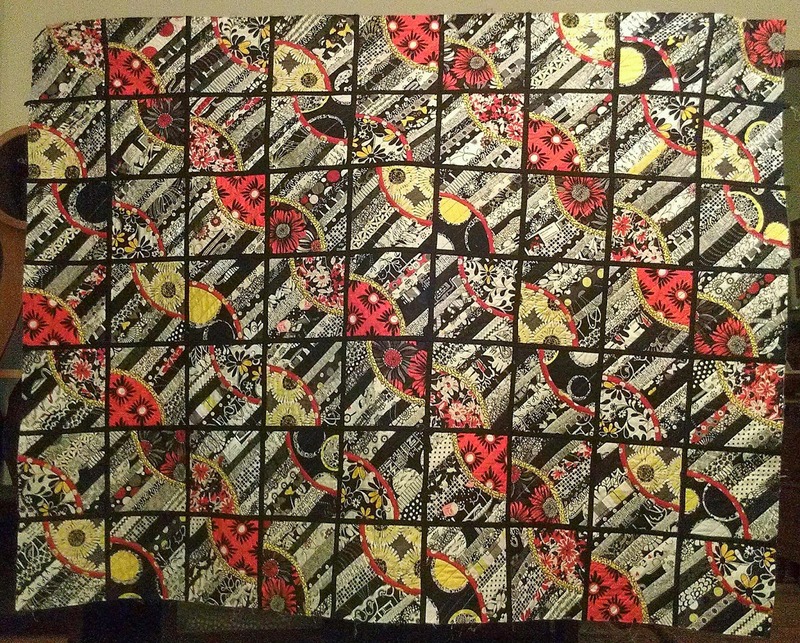 I've finished and attached seven of the ten rows and am at a temporary stand-still while I await the arrival of more black Michael Miller Cotton Couture. I guess I didn't do such a great job of estimating how much I'd need for all that shashing! A little after noon today, I received a call from yesterday's hostess who was having a quilting emergency and needed a sympathetic ear. After chatting for a while, I sensed that she could probably use a little company, so I offered to stop by and lend a hand. She accepted my offer and I headed over to provide what little aid I could. 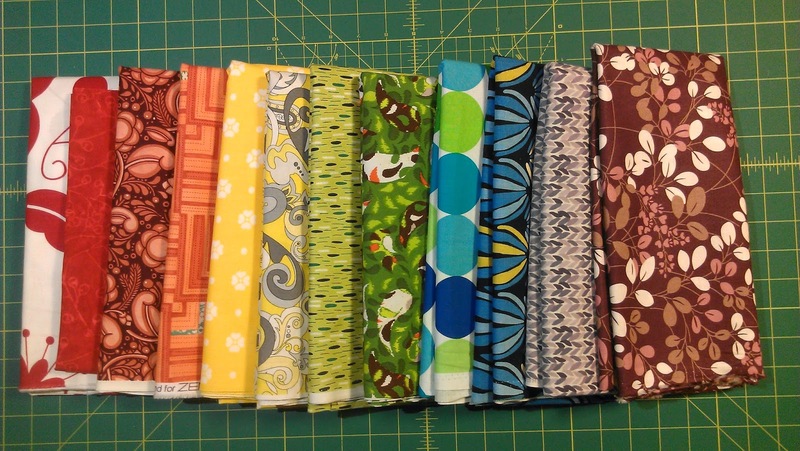 So, while I wait patiently for my fabric shipment, I've started planning a quilt for my sister's charity walk in the fall. I'm going for a variation on a rainbow strip-and-flip. I haven't seen anything exactly like what I want to do, so I hope it turns out. And, of course I still have to work on my quilt for the Quilt Alliance contest, and the baby quilt for the guild, and those other two or three (or four or five) quilts awaiting my attention.